Home » Blog » One blesses the bad as one blesses the good. One blesses the good as one blesses the bad. One blesses the bad as one blesses the good. One blesses the good as one blesses the bad. Blessings are what we as Jews use to articulate our spiritual experiences. Just as lighting a candle with a blessing means that we are bringing light and holiness into our lives, so, too, do we make a spiritual moment out of a physical act when we say blessings before and after eating. The possibilities for inspiring our blessings seem unlimited: gratitude for seeing the light of the morning (“Pokayah ivrim”: we bless the Creator who opens our eyes); praise for the garments which cover our body (Malbish arumim: we bless the One who clothes the naked); awe at the sight of the sea (Oseh ma’aseh b’raysheet: we bless the Creativity of Creation). 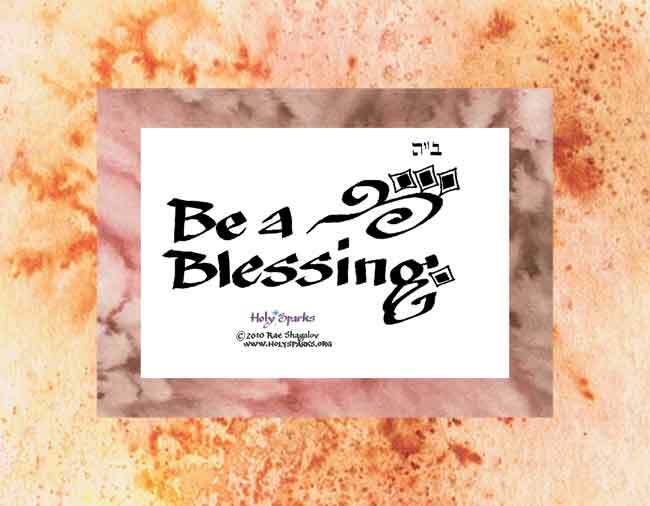 There are traditional Jewish blessings for things we taste, do, smell, hear, see…the rabbis of the Talmud suggest that each person could offer a minimum of one hundred blessings each day. Yet, as the quote from the Mishnah shows, we do not only make blessings over the joy or pleasure in our lives. If you hear good news, the proper blessing is Baruh Atah Adonai, Elohaynu Meleh ha-Olam, ha-Tov v’ha-Maytiv, Blessed are You, Creator of the Universe, Who makes the good and the even better! Upon hearing bad news, one says, Baruh Atah… ha-Olam, Dayan ha-Emet, Blessed are You…Judge of Truth. Why does the Mishnah go out of its way to tell us that the bad requires a blessing, too? Why does it then repeat the idea, letting us know that the good is blessed in a similar way to the bad? In my experience, good news and bad news don’t necessarily come separately: every new beginning is an ending; every start is a farewell. Sometimes, the very things we have been praying for bring us pain; other times, things we would have given anything to avoid bring us blessing we could not have imagined. Perhaps when we bless the bad as we bless the good, we bless the possibility in each experience to bring us joy or pain. We bless the gift of the moment and at the same time we bless the gift of perspective, the sight which will only come later and interpret the experience as good or bad. The month of Nisan is a month of special joy in our spiritual calendar. In it, we celebrate Pesah, the Feast of our Freedom, breaking physical and spiritual bonds into liberty and movement! Yet a day into this celebration, we enter the period of the ‘Omer, a time which many observe with mourning practices. Our joy and our grief come together, in the calendar and in our lives. There is a special blessing which is traditionally said during the month of Nisan (beginning this year on the evening of March 11th). Upon seeing trees blossoming for the first time in the year, one says, Baruh Atah Adonai, Elohaynu Melech ha-Olam, shelo heesar b’olamo davar, u’vara vo briyot tovot v’ilanot tovim l’hanot bahem b’nay adam. Blessed are you….Who has withheld nothing from this world, and Who has created beautiful creatures and beautiful trees for humans to enjoy. The Nisan prayer is a prayer celebrating growth. We bless the Holy One whose world models for us seasons of turning in and turning out, moments of joy with moments of loss, a world where blessing is in the good and the bad. This Nisan, may we find blessings in the moments we have, and may we find many moments to offer blessings.